As I explained in my introductory Library Day in the Life post for round 8 I have been keeping a detailed record of my work activities. My aim was to use this record of an average week to see if some estimates I had made previously (for how I spend my time over a term) were anywhere near accurate. 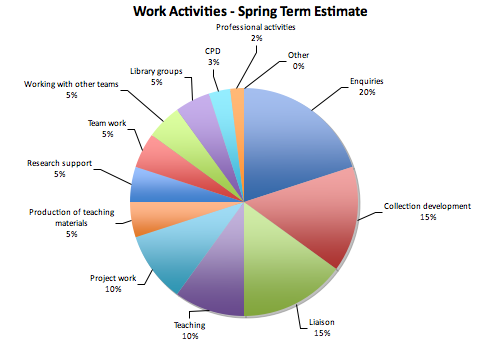 The charts below show the percentage of time I spent on various activities that were identified as the main tasks of an Academic Support Librarian. The first chart shows the time I spent on each activity during the past week. The second chart shows the estimates I made for how much time I spend on each activity during the Spring term (January – April). 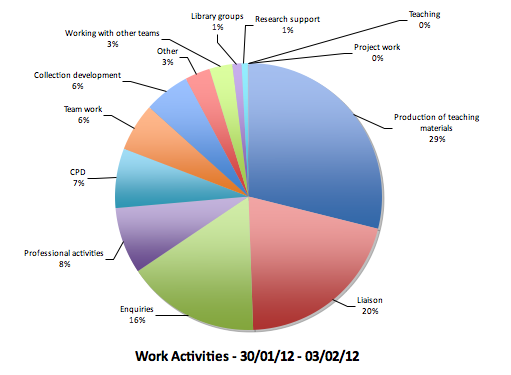 Comparing to the two has left me fairly happy with the estimates I made about how I spend my time. The activities missing from my work this week, that came quite high in my estimate, were teaching and project work. I’ve done no teaching this week, but have already done some, and will be doing more this term. As for project work, a lot of the work I did this week that I classed as production of teaching materials was also project work for an information skills tutorial I am creating. Given the job I do I think it is unsurprising that liaison and enquiries came out as top activities on both charts. Within liaison in this week’s tracking I included all work I did on email (6 hours and 22 minutes in total) as well as meetings with staff in the business school and the one Student Staff Liaison Committee meeting that I attended. One thing I was particularly interested in, having been asked a few times lately, was how much time I spend on Twitter. My total for the week was 1 hour and 33 minutes, an average of a little under 20 minutes per day. Professional activities scored quite highly this week as I’ve been doing quite a bit of work on developing a new website for the Business Librarians Association. I also used the “Other” category this week which I had used for the estimate. Within this category I included the time I spend doing general admin and planning my week. That’s a really interesting way of examining a working week. You seem to have a good overview of how your time is spent. One thing I would be interested in seeing, particularly in my job, is the different in time spent dealing with in-depth assignment based enquiries compared to other enquiries, such as help with printing, booking PCs, etc. I know that our in-depth enquiries has dramatically decreased over the last few years so it would be interesting to see how much time we now spend dealing with pratcical support. Thanks for your comment Rachel. We track our enquiries on a weekly basis. We’ve got a form with fields including how the enquiry was received (email, in person etc. ), the status of the enquirer (UG, PGT, staff etc.) and the time it took to resolve the enquiry. We then keep a running total in each field using a five bar gate. Something like that could easily be ammended to cover the type of enquiry and you could do it weekly like us, or as a snapshot as I did with my time tracker for this post.